The Winnebago LeSharo (also marketed as Itasca Phasar, with different color schemes and some equipment changes) is a Class B (low-profile) recreational vehicle that was assembled by Winnebago Industries in Forest City, Iowa. While using a cutaway van chassis like larger motorhomes, the lower-roofed LeSharo was designed in the interest of fuel efficiency, derived from the front-wheel drive Renault Trafic. Imported into the United States through the use of CKD kits, the Trafic chassis shifted from V8 engines to four-cylinder and diesel engines. The LeSharo ended sale after the 1992 model year. From 1995 to 2003, Winnebago revisited the concept with the Rialta. While configured similar to the LeSharo, the Rialta was based upon the Volkswagen Eurovan chassis, offering far more power output. Built during the era when tougher fuel economy laws had just come into effect in the US and the national speed limit was 55 mph to save fuel, the LeSharo was intended to appeal to drivers who wanted better fuel efficiency than traditional motor homes. The chassis and cab were built by Renault, based on the same platform as the Renault Trafic (T5, LWB). Renault sold complete knock down (CKD) kits to Winnebago All the 1983 models were powered by the 2068cc all aluminum OHC 4 cylinder normally-aspirated diesel engine (producing 66 hp) with a four-speed manual transaxle, yielding 22 mpg (US). In 1984 an optional turbo charger was added, increasing power to 75 hp. In 1985, a 2165 cc Bosch fuel injected, four-cylinder gasoline engine became available, with a three-speed computer-controlled automatic transaxle. At 100 hp (75 kW), this version delivered more power but somewhat less fuel economy and making the vehicle 423 lb (192 kg) heavier. After 1986, the diesel engine was discontinued. Catalytic converters and carbon canisters were not required for motor vehicles exclusively for sale in Europe and were only fitted for the US market to comply with the US E.P.A. requirements for exhaust and evaporative emissions at the time. The Lesharo was fitted with a catalytic converter made by Teneco Walker's European division and a carbon canister from GM to comply with conformance standards. Winnebago also produced the smaller Centauri, closer in layout to a conversion van (retaining the toilet, missing a full bed and kitchenette); it was produced through 1985. The two-seat Utility Van was produced from 1984 to 1992. GVWR for the 1985 TD model of Lesharos and Phasars is 5,830 pounds (2,640 kg). The Winnebago LeSharo was redesigned for the 1987 model year with a more aerodynamic design and a larger rear window. The spare tire was moved from the outside rear into a rear storage compartment. Gross Vehicle Weight increased from 5,830 pounds (2,640 kg) to 6,677 pounds (3,029 kg) and exterior height increased from 97 inches (2.46 m) to 99 inches (2.51 m). The diesel engine was no longer available. An optional five-speed manual transaxle became available in 1988 and 1989 only. A heavy duty rear axle was included in 1989 and subsequent MYs. In mid-1989, the fuel injection unit was changed from a Bosch LU-Jetronic with Lambda Probe (oxygen sensor) to a RENIX (Renault-Bendix joint venture) based one. Therefore, fuel injection parts between the differing units are not interchangeable as Bosch connectors are rectangular and RENIX ones are oval. This new engine produced a little bit more power than the earlier version, at 103 hp (77 kW). Approximately 21,000 Renault Trafic I based, Winnebago vehicles were sold between 1983 and 1992 as the Lesharo, Itasca Phasar, Century, and Utility Van (two-seater). 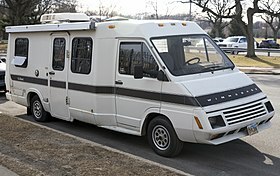 ^ "Curbside Classic: 1985 Winnebago". Truth about cars. Retrieved 15 January 2012. ^ a b c d e "Winnebago–Renault". WinnebagoParts.com. Retrieved 2018-11-20. ^ Shuldiner, Herbert (March 1983). "Pocket Motor Home". Popular Mechanics. Times Mirror Magazines, Inc. p. 71.